Cosmos ‘Sensation’ with Rudbeckia ‘Marmalade’ in the background. Being an alpha male hunter gatherer type (and eligible bachelor with clean driving licence and own shed. )…my blokey eyes and blokey brain can’t distinguish pink from carmine from cochineal. I haven’t however let this get in the way of my love for Cosmos ‘Sensation’. Cosmos ‘Sensation‘ has all the above colours and even a few creamy whites to add to the mix. The daisy like flowers float atop of strong stems amidst deep green ferny foliage. 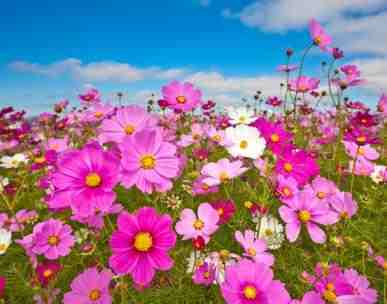 The flowers are abundant and keep coming back harvest after harvest. It is a dream plant for the cutting patch. You will see big name seed companies saying you can sow from February…I think this is probably a way of selling more seeds. If you had high powered lights and heated benches then I’m sure this wouldn’t be a problem….but to my mind suggesting you can sow that early is disinformation and should be ignored. 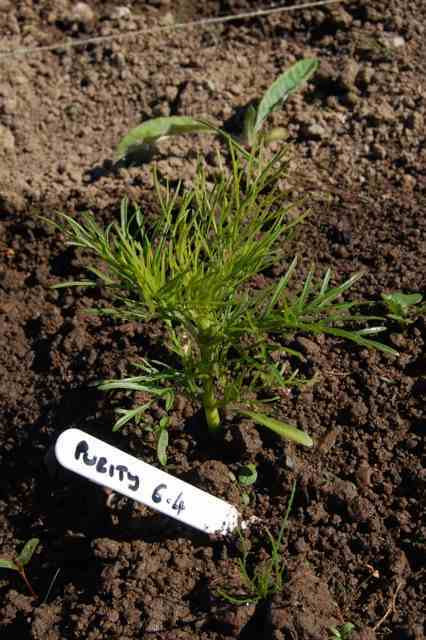 Cosmos seedling…or plantlet…probably about six weeks old. Cosmos ‘Sensation’ is an all time classic for the cutting patch…it was a huge favourite over the pond just before the war and won the 1936 AAS award (All American Selection). Indeed it has something of the 30’s about it. Bees and butterflies are also big into ‘Sensation’ and growing it can only help the biodiversity in your patch. If you haven’t tried it then I suggest you do….you will LOVE it! 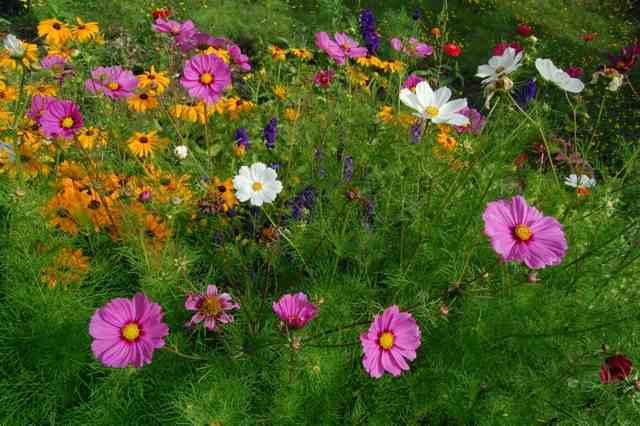 I sell Cosmos ‘Sensation’ at £1.95 for 80ish seeds. PS Throughout January I am giving away a packet of Cosmos ‘Purity’ with every order. Yeah olde vintage post on growing ‘Sensation’ from two years hence. Growing Dill for the cutting patch. Getting started with a cut flower patch. Daucus Carota. Queen Anne’s Lace. Wild Carrot. Borago officinalis. Borage. Absolutely love your website, much more fun than Suttons and T and M! Wanting to grow some flowers for a 5 September wedding, realize ideally i should have planned this when my son first told me about the exciting event, but obviously hadn’t got my brain in gear. Got lots of ideas but do you have a moment to jot down some that will flower end of the summer for a September pick, if i can grow a few of their flowers it will be such a thrill for me and a great help for them. i’m thinking table flowers mainly.